Aware of the power of table tennis, the aim to promote the brand in Switzerland and across the world, China Construction Bank, the second biggest bank in the world, is the title sponsor of the 2018 ITTF Europe Top 16 Cup. Play takes place in Montreux on the weekend of Saturday 3rd and Sunday 4th February. 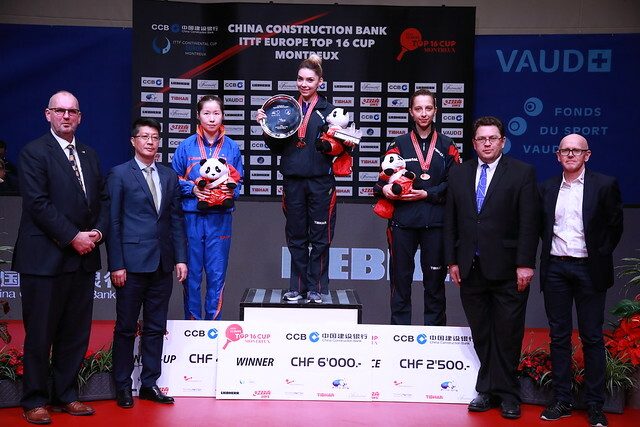 The International Table Tennis Federation, the European Table Tennis Union and the Local Organising Committee in Switzerland are delighted to announce China Construction Bank as the title sponsor of the 2018 ITTF Europe Top 16 Cup taking place this weekend in Montreux. China Construction Bank – Zurich Branch is partnering with the event to promote the bank’s brand in Switzerland and across the world utilising the power of table tennis. There will be sixteen players in each of the Men’s and Women’s singles events, with the top three in each qualifying for the World Cups later this year, namely, Women’s World Cup in Chengdu in September, and the Men’s World Cup in Paris in October. Fifteen players are the top ranked in Europe, with the host nation, Switzerland, nominating their players, Lionel WEBER and Rachel MORET, to go head-to-head with Europe’s best. It’s knock-out all the way through both Women’s and Men’s Singles events, action packed from the word go!